Habits – we all have them and our children are no different. But unhealthy habits like thumb sucking, tongue thrusting, mouth breathing, lip biting and nail biting can have a negative impact on our child’s orofacial function. Habit breaking appliances are orthodontic devices employed to attenuate and eventually break these habits. These custom fabricated appliances are either removable or fixed and serve as a mechanical restrainer and a reminder to discontinue the habit. 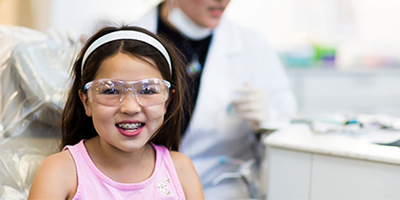 By breaking these habits early, we can often sidestep serious orthodontic issues that necessitate lengthy treatment. The first step involves taking x-rays, photographs and impressions. A crib will be custom fabricated to fit your child’s mouth and will be placed at the subsequent appointment. It can be a fixed palatal crib or a removable one. This crib is a small metal appliance that perfectly fits behind your child's upper front teeth and is barely visible. Your child will be periodically monitored over the next several months. The appliance isremoved when the dentist is sure that your child has stopped the habit and won’trevert to it. The crib isn’t painful to wear, but after it is fitted, there may be some initial tenderness and a period of acclimatization for the child. Eating difficulties and disturbed sleep patterns are some of the problems associated with the usage of habit-breaking devices. Upon removal of the appliance some habit breakers reported short-term deleterious effects on speech. Hence, it is advisable that this habit breaking device is used for children older than 4.5 years whose speech is mostly developed. Habit breaking device is generally well-tolerated. It does not cause any discomfort and is not affected by eating. It serves as a reminder to the child not to place the finger in his/her mouth and makes the habit a non-pleasurable one. It also reduces the satisfaction your child has when sucking the thumb, and over time, will stop the habit completely. The habit breaking appliance should remain in place for at least six months to make sure that the habit is completely stopped or corrected. If your child is over the age of five and the time for the eruption of the permanent incisors approaches it is important for you a schedule an appointment with your child’s dentist to see if you child needs a habit breaking device. Remember, early intervention can save years of orthodontics and help in the success of the habit breaking appliance as well.